Chef Lata serves the second course: a shrimp and seafood stew accompanied by Carolina gold rice. 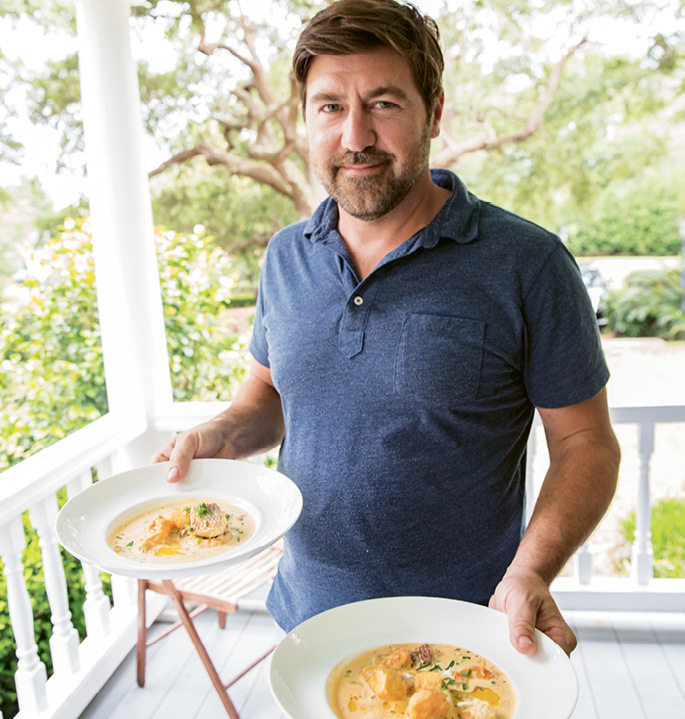 When I first arrived on the doorstep of chef Mike Lata’s James Island farmhouse, I wasn’t exactly sure what to expect, but I was certainly excited. I was there to see the filming of Moveable Feast with Fine Cooking, a show highlighting chefs and foodways from across the United States. 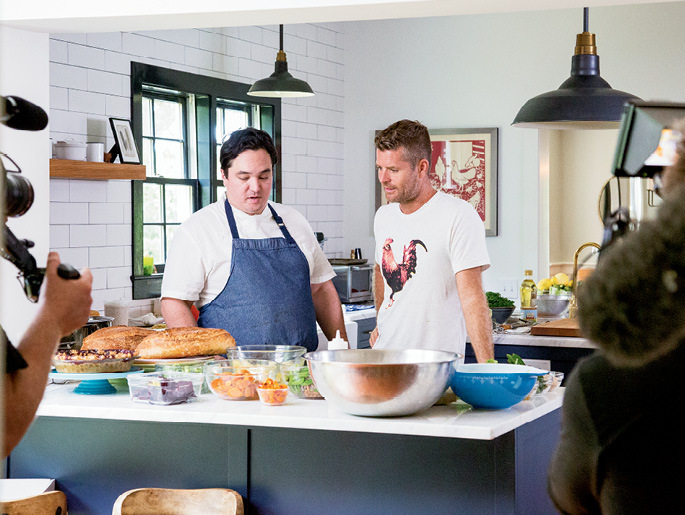 Charleston was setting the scene for two episodes of its fourth season, and I joined the crew on the second day of filming when chefs Lata and Jason Stanhope (of The Ordinary and FIG) were taking center screen. 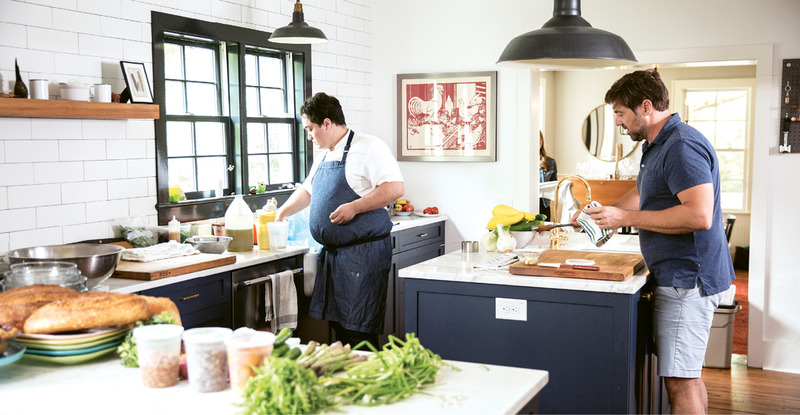 It was my first time witnessing the behind-the-scenes of a television cooking show, and I had several questions: What don’t viewers see at home? How much gets prepared in advance? Is the food even good, or does it simply look pretty for the cameras? The prep: Evans and our chefs would be demonstrating the cooking processes right in Lata’s kitchen, and I was eager to see what had been prepared already. Not too much, as it turns out. Some of the veggies, for instance, had been pre-chopped and set aside, but not everything. For this cooking show at least, the chefs would be making the meal in real time. The demos: The cameras started rolling as chef Lata began to filet one of the snappers. Evans peppered him with questions, while Stanhope worked near the sink with the shrimp. Later, Evans spoke with Stanhope while Lata moved out of frame. Every so often, a producer would request a chef to hold an ingredient and repeat a line. But for the most part, the action unfolded naturally, and the chefs seemed comfortable talking through their processes. In order to be out of the cameras’ shots, bystanders couldn’t be in the kitchen. I could hear what was happening, but it was tough to see. Viewers at home truly have the best vantage point. The feast: A long table was arranged on the front porch. I took a seat next to Glenn Roberts of Anson Mills, whose Carolina Gold rice would make an appearance in the second course, and across from local architect David Thompson and his wife, Sara. Soon, the first dish arrived: a fresh snapper crudo accompanied by a crisp spring vegetable salad (pictured below). A shrimp and seafood stew (above, with Lata) served with the Carolina Gold came out next, and a warm berry cobbler topped with vanilla ice cream capped off the meal. 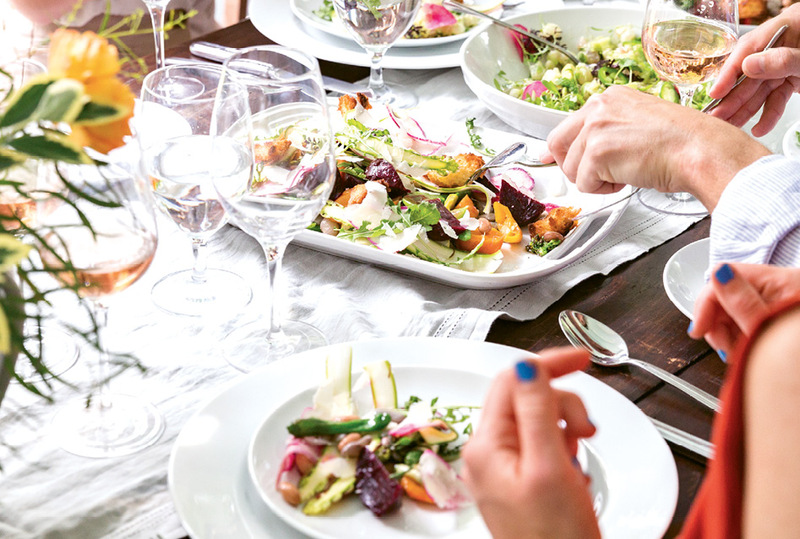 On Screen: The fourth season of Moveable Feast with Fine Cooking, a production of WGBH Boston, airs this fall. Specific dates for the two Charleston episodes have yet to be announced; follow @charlestonmag or Facebook for updates.